Primary target of Operation Inherent Resolve and of the military intervention against ISIL: in Syria, Iraq, Libya, and Nigeria. 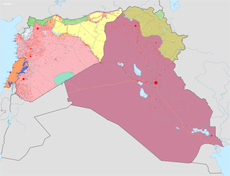 Note: Iraq and Syria contain large desert areas with sparse populations. These areas are mapped as under the control of forces holding roads and towns within them. شام و عیراق ایسلامی دؤولتی قیساجا:داعش ؛ (عرب دیلی: الدولة الإسلامية في العراق والشام) سلفی و وهابی مسلکده بیر دؤولتدیر. ۲۰۱۴.جی ایلده سوریه قاریشیقلاریندا باش تاپیب و اؤزون مستقل بیر تشکیلات بیلیندیردی. سون ایللر عیراق اؤلکه سینده یۆرودو و موصول و چوخلو منطقه‌لری اله گتیردی.ابوبکر البغدادی بو تشکیلاتین باش لیدری اولور. بو تشکیلات ایندی سوریه عیراق اؤلکه سینه قاریشیق سالیب و چوخلوجا اؤلکه لرده تروریستی سالدیر سالیب. لیبی ,نیجریه, افغانیستان اؤلکه لریندن القاعده باخیشینا باغلی بیر حوکومت یارادیب.اولارین کؤکو توحید و جیهاد (التوحید والجهاد) پارتیلاردیر.بو پارتیلار 1999 -جو ایلده ابومصعب الزرقاوی باشچیلیقینا قورولدو.بو پارتیلار عیراق القاعده سی آدلاندی.بادشا عیراق دولتی و آمریکا اوردوسو ایله ساواشدی و سونرا 2006اینجی ایلده نئچه سلفی و وهابی پارتیلار ایله بیر اولدو و موجاهید شوراسی پارلیمانی (مجلس شورای مجاهدین) اولدو.بو تشکیلاتدا انبار اوستانیندا ابو ایوب میصری و ابو عمر بغدادی باشچی اولدو هابئله 2010 اینجی ایلده آمریکا اوردوسو بو ایکی باشچینی اؤلدوردو و اولارین یئرینه ابوبکر بغدادی باشچی اولدو. 2012اینجی ایلده سوریه قاریشیقلاری باشلادی و 2013اونجو ایلده بو تشکیلات سوریه ده چوخلو یئرلری اله گئچیلدیب و سوریه و عیراقدا ایسلامی دولت (داعش) آدیندا حوکومت قوردو.سوریه ده رقه شهرین باشکند ائدیب و عیراقدا رمادی و فلوجه شهرلرین آلدیلار.2014 اینجی ایلده موصول شهرین اله گئچیلدیب و چوخ گوجلو بیر حوکومت یاراددیلار.1394 اینجی ایلده سوریه نین یوزه 60 یئرلرین و عیراقدا یوزه 40 یئرلرین آلمیشدیر.عیراقدا حشدالشعبی اوردوسو داعش ایله ساواش اوچون قورلدو و داعش چوخلو ساواشلاردا بو اوردو و عیراق اوردوسونا اوتوزدو.چوخلو شهرلری الدن وئریب و2017 اونجو ایلین فوریه آیندا تکجه موصول شهرینده نئچه محله ده قالیر.سوریه ده چوخلو یئرلری الدن وئریب و گوجو چوخ آزالیب. بو تشکیلات القاعده دن آیریلیب هابئله القاعده بو تشکیلاتی اوزوندن بیلمیر و نئچه ساوشادا بو تشکیلات ایله ساواشیب. 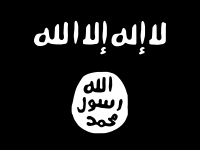 ↑ "Isis flag: What do the words mean and what are its origins?". The Independent. 7 July 2015. ↑ "Al-Qaeda disavows ISIS militants in Syria". BBC News. 3 February 2014. ↑ Holmes, Oliver (3 February 2014). "Al Qaeda breaks link with Syrian militant group ISIL". Reuters. ↑ Islamic State. Australian National Security. Australian Government. یوْخلانیلیب22 July 2014. ↑ The Islamic State. Stanford University (23 January 2015). ↑ ۱۱٫۰ ۱۱٫۱ Saltman, Erin Marie; Winter, Charlie (November 2014). Islamic State: The Changing Face of Modern Jihadism (Report). Quilliam Foundation. ISBN 978-1-906603-98-4. Archived from the original on 26 February 2015. ↑ ۱۲٫۰ ۱۲٫۱ Crooke, Alastair (5 September 2014). "You Can't Understand ISIS If You Don't Know the History of Wahhabism in Saudi Arabia". The Huffington Post. ↑ Kirkpatrick, David (24 September 2014). "ISIS Harsh Brand of Islam Is Rooted in Austere Saudi Creed". The New York Times. ↑ Rubin, Alissa J. (5 July 2014). "Militant Leader in Rare Appearance in Iraq". The New York Times. ↑ Al-Tamimi, Aymenn Jawad (24 January 2016). An Account of Abu Bakr al-Baghdadi & Islamic State Succession Lines. Aymenn Jawad Al-Tamimi's Blog. ↑ Abd al-Rahman Mustafa al-Qaduli. U.S. Department of State, Bureau of Diplomatic Security (5 May 2015). ↑ Schmidt, Michael (25 March 2016). "A Top ISIS Leader Is Killed in an Airstrike, the Pentagon Says". The New York Times. ↑ Islamic State Spreads in North Africa in Attacks Ignored by West (16 March 2016). ↑ Jawad Al-Tamimi, Aymenn (January 2016). An Account of Abu Bakr al-Baghdadi & Islamic State Succession Lines. Aymenn Jawad Al-Tamimi's Blog. ↑ "ISIS Leadership". Frontline (PBS). 2015. Retrieved 14 August 2015. ↑ ۲۲٫۰ ۲۲٫۱ Lister, Charles (2014). Islamic State Senior Leadership: Who's Who. Brookings Institution. آرشیولنیب اصلی نۆسخه‌دن on 28 March 2016. ↑ "Here's What We Know About the 'Caliph' of the New Islamic State". Business Insider. Agence France-Presse. 29 June 2014. ↑ "ISIS Spokesman Declares Caliphate, Rebrands Group as Islamic State". Jihadist News (SITE Intelligence Group). 29 June 2014. ↑ "Pentagon Confirms U.S. Strike in Syria Killed ISIL Leader". DoD News. 12 September 2016. ↑ Garland, Chad (14 July 2016). "Islamic State says top commander is dead; Pentagon unsure". Stars and Stripes. ↑ Worley, Will (13 July 2016). "Isis confirms death of hugely popular 'minister of war' Omar al-Shishani". The Independent. ↑ Starr, Barbara (15 March 2016). "U.S. assesses ISIS operative Omar al-Shishani is dead". CNN. ↑ Tarkhan Tayumurazovich Batirashvili. U.S. Department of State, Bureau of Diplomatic Security (5 May 2015). آرشیولنیب اصلی نۆسخه‌دن on 18 May 2015. ↑ "Isis's propaganda chief, Dr Wa'il, killed in airstrike, Pentagon confirms". The Guardian. 16 September 2016. ↑ "ISIS 'essentially moved' its Syria HQ from Raqqa to Deir ez-Zor province". Russia Today. 23 April 2017. ↑ Syrian army captures Mayadin from ISIS near Deir ez-Zor. Rudaw (14 October 2017). ↑ Iraq forces launch 'last big fight' against IS. Rudaw (26 October 2017). ↑ "Anti-IS forces converge on Syria border town". AFP. 4 November 2017 – via Yahoo News. ↑ "Syrian army & allies capture last major ISIS held town in Syria". Russia Today (TV-Novosti). 4 November 2017. ↑ Francesco Bussoletti (29 June 2018). Syria, the Isis pockets of resistance at Deir Ezzor are reduced to two. Difesa & Sicurezza. یوْخلانیلیب6 July 2018. ↑ Cockburn, Patrick (16 November 2014). "War with Isis: Islamic militants have army of 200,000, claims senior Kurdish leader". The Independent. ↑ Sciutto, Jim; Crawford, Jamie; Carter, Chelsea J. (12 September 2014). "ISIS can 'muster' between 20,000 and 31,500 fighters, CIA says". CNN. ↑ Michaels, Jim (4 February 2016). "New U.S. intelligence estimate sees 20-25K ISIL fighters". USA Today (Washington, D.C.). ↑ Sciutto, Jim; Starr, Barbara; Liptak, Kevin (4 February 2016). "ISIS fighters in Libya surge as group suffers setbacks in Syria, Iraq". Washington, D.C.: CNN. ↑ "ISIS down to 6,500 fighters, holds only 3 percent of Iraq". Washington Examiner. 17 October 2017. ↑ Gartenstein-Ross-ROSS, Daveed (9 February 2015). How many Fighters Does the Islamic State Really Have?. War on the Rocks. ↑ Zelin, Aaron Y. (June 2014). The War between ISIS and al-Qaeda for Supremacy of the Global Jihadist Movement. Research Notes (Report) 20 (Washington Institute for Near East Policy). ↑ OKRA Home. Department of Defense – Government of Australia. یوْخلانیلیب25 October 2017. ↑ Operation IMPACT. یوْخلانیلیب6 March 2018. ↑ Nikoleta Kalmouki. Greece Brings War Against the Islamic State. یوْخلانیلیب2018-03-17. ↑ L’Italia pronta a bombardare Isis in Iraq. La Difesa: ipotesi da valutare. بۇ صفحه‌‌ سوْن دفعه ‏۲۹ اوْکتوبر ۲۰۱۸، ‏۲۲:۳۹ تاریخینده دَییشدیریلمیشدیر.